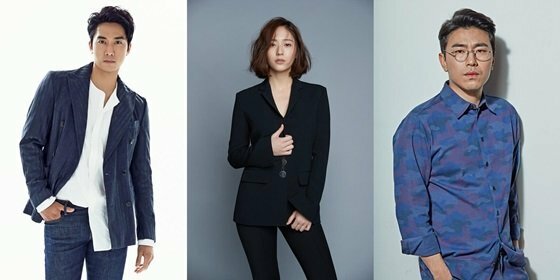 Song Seung-heon, Krystal, and Lee Si-eon in "The Player"
Song Seung-heon, Krystal and Lee Si-eon have signed onto the new OCN drama "The Player" according to CJ E&M. "The Player" is a drama about a genius conman, a tophacker, a gifted driver, and a fighter. They are the cream of the crop and their goal is to re-collect illegal funds..
Song Seung-heon takes on the role of genius conman Kang Ha-ri. He's good-looking, is gifted with words and was born bold. He is the only son in a family of investigators, but loses them in an unfortunate accident. He then lives a completely different life surrounded by lies. Krystal takes on the role of Cha Ah-ryeong who calls herself the best driver there is. She was raised as an orphan and learned a hodgepodge of skills such as pick pocketing and opening locks to survive after she left the orphanage. The skill that stands out the most is driving. Cha Ah-ryeong is tired of her life full of lies and struggles. Then she meets Kang Ha-ri who makes her an offer. Lee Si-eon is a gifted hacker named Im Byeong-min. He solved everything with a computer since he was young and he is able to find anyone and any information using it. Without it, he's timid and scared. His skill gets involved with people who want to use it for something illegal until Kang Ha-ri saves him. "The Player" is coming later this year. "Song Seung-heon, Krystal, and Lee Si-eon in "The Player""